AFTER TESTIMONY – Charles Manson leaving courtroom where he appeared as a witness in behalf of Catherine (Gypsy) Share. 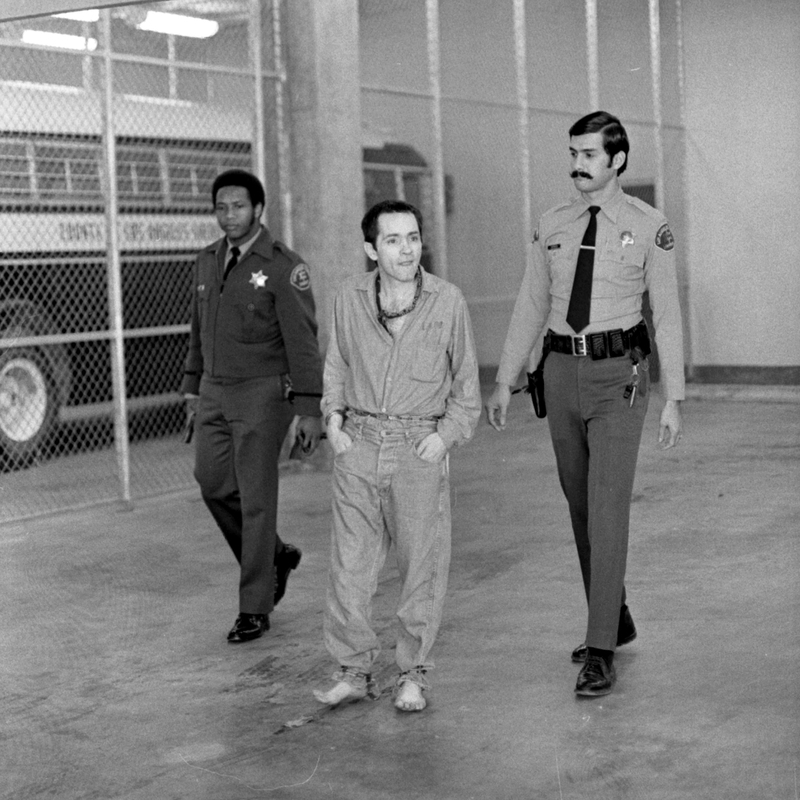 Manson, wearing his hair cut short, is manacled hand and foot. “These people are just part of a group that the newspapers made up…and there was no motivating force other than a lot of people having fun,” Manson told jurors in a sanity hearing for four of his associates. He had been called as a witness on behalf of Catherine (Gypsy) Share. Miss Share, 30, was convicted last Wednesday of taking part in two robberies in connection with a plan to free Manson from prison. Convicted with her of taking 143 rifles and $630 in cash from a Hawthorne surplus store and $2,600 from a Covina beer distributorship were Mary Brunner, 29; Lawrence Bailey, 23, and Kenneth Como, 33. All four have entered pleas of innocent by reason of insanity and that issue is now under consideration by the same seven-woman, five-man jury that found them guilty last week. During his hour-long testimony, Manson stressed that the antisocial, violent attitude of the group around him was the outgrowth of many contacts with law enforcement. Los Angeles Dep. Dist. Atty. Harland Braun asked asked Manson if he thought any of the four defendants were insane. “That’s a relative term,” he replied. They wouldn’t even give him shoe’s.